Paleontological hoaxes have implications for science. When incautious researchers and museums expend their limited resources to acquire fraudulent specimens of limited value, this diverts the use of those funds from the acquiring of authentic specimens. Moreover, such scandals can be exploited to discredit evolutionary scientific inquiry (see, for example, the pseudoscientific article by Harrub and Thompson, 2001). We underscore that it is imprudent for paleontological researchers and institutions to purchase and/or trade in fossils lacking clear provenience information. 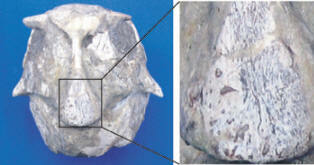 Techniques for detection of forgeries described herein are to be viewed as a last resort and/or safety precaution in verifying specimen integrity. A second opinion from a trained paleontologist or fossil preparator may also give a valuable contribution to detect frauds.